Hummingbirds are among smallest of all birds. They’re incredible aerobatic and can fly up, down, backward, they can change direction in an instant and effortlessly shift from full speed to practically standing still in the blink of an eye. This is in part because of how light-weight they are, with some hummingbirds weighing no more than a penny! Their physical lightness is also a beautiful reminder for us too to lighten up! If we let ourselves release the weight of doubt, fear, and worry… Like the hummingbird, our spirits can begin to hover and soar as we follow our path of joy. 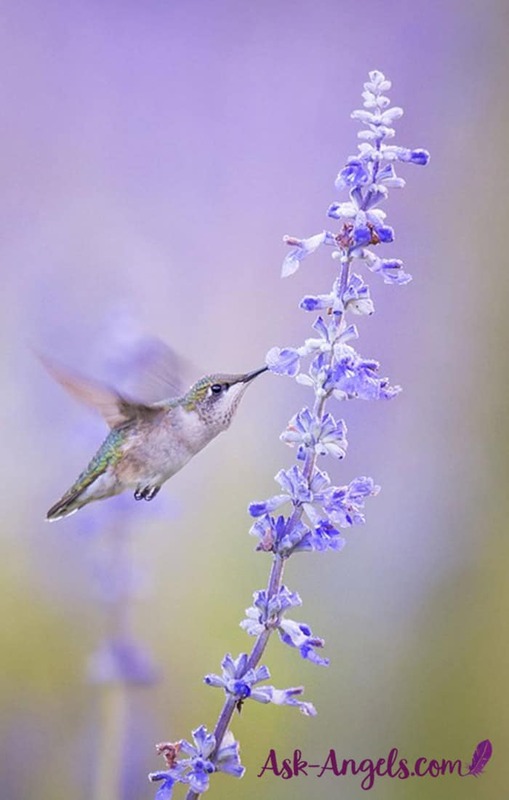 The nectar of life is, of course, one of the ultimate symbols for joy… Hummingbirds represent just that —living a life filled with joy, light, and sweetness — as they hover from flower to flower they’re fully present in the moment, completely following the path of joy. If you’ve ever heard the soft hum of a hummingbird’s wings, you’ll notice that it too is quite distinct. This hum is said to carry healing light and magical energy, which hummingbirds have a way of bringing to us on a number of levels. If you feel hummingbird represents something else not mentioned… You’re right! Let your own heart and intuition reveal exactly what it is the sweet little hummingbird has to offer you in this very moment. I'd love to hear your hummingbird stories! Leave me a comment below! WOW~MOST AMAZING THING JUST HAPPENED TO ME~was sitting out side on steps in sun / 41 degrees / drinking hot lemon water. I closed my eyes and was saying the Universe, Source, God are watching over me. Just been told last week have breast cancer. As I sat there with eyes closed I repeated my treadmill mantra: with every step I take, I STOMP our a cancer cell in my body. stayed that way for a few moments then opened my eyes and within a few moments a beautiful humming bird came humming within 2 feet of my face. What is the message of the humming bird ? does anyone know. I’m sure it came from Source. I have always loved hummingbirds, and frequently think of the song “Hummingbird don’t fly away, fly away , hmmm, hmmm hmmm,…. by Seals & Crofts. Ive been struggling to be a mother because i had a baby that passed in 2013 from sids. I now have a 2nd son who is 3 and i lost my job in nobember my home also in novemeber this last year. Luckily, my teacher from my old pharmacy school opened het arms and home to us. Ive been so angry with my by for causing me to lose my home and job we have done nothing but fight. Today my bf didnt come home because of a arguement i went outsife to check if his truck was here anf its not. I sat down smoked my cigerette and looked up a hummingbird came down from know where and was picking something off the ground as i watched it my heart felt warmth instead of anger. I looked up the meaning and found your page. The fact you say the wings move in an infinitive symbol brought tears of joy to my heart because that sign resembles my first baby to me. I love this sign and for me it stands for internally being with him one day and that i will be his mommy forever! It did bring a joy to my heaft and smile to my face because sometimes we forget what beauty we have in ourlives and foocus on the negative. Im here at my dear friend and teachers home because this is whete im meant to be today. I need to be thankful and accept what happened there is no going back only forwards so thank you for your interpretation of the meaning of the hummingbird its beautiful..
Today at laney college I was in the library on my phone when a hummingbird I didn’t even know was there it didn’t come to my face but it came pretty close from behind me I herd the hummingbirds buzzing and I don’t know why it did that and it came up close to my ear two times I thought it was just coincidence but because it came up to me the second time I asked myself why did it do that I still wonder. And this is my past life I used to have not what most kids had which was a horrible childhood with a cousin who often visited and kept on breaking the family apart and none of them got along and they didn’t even take the time to talk things out like normal people would but they end up just hating on each other saying mean stuff about each other behind each other’s Bach especially me nobody was happy with the choices I made amd I was struggling with doing well in high school that things got worse that time I thought I was a huge failure that I embarrassed the family because of this even as a kid I turned out to not have a happy childhood I wish to erase that-at but can never do it it effects me to this day and even thought my family relationship has gotten better but inside I know that I still feel that pain it’s still there I try to move on but the scar that it left it left me to not trust people in my family and that is because even today my sisters relationship with my father is worse and I still feel like nothing has changed I try to stay positive but because of how I grew up I get angry sometimes for no reason and i get defensive because so,e topics remind me of how I used to be which I was a not nice person but know I’ve changed to being nice but sometimes I keep thinking about it it just pops into my head and I get depressed ever thing about it it scares me and it made me hate how I used to be and how my family was how can I move forward in my life without having. This painful memory creeping up on me? My mother passed away on January 4, 2018. I was her caregiver and as much as I knew she was not going to get better I could not come to grips with losing her. I handled her funeral, sale of her home and all her financial matters and moving her personal property to storage. I was so sad and depressed. One day I opened the door to her home and a hummingbird flew in and flew to room to room. I couldn’t help but think is this a sign from my mom? Finally I opened the door after 5 minutes at it flew out. I hoped that she was telling me she was still here with me and that she was at peace. I can only wonder! This morning i was feeling a little depressed because of some problems with loved ones. I was sitting out on my front porch and had been there for about 20 minutes. All of sudden i heard a deep buzzing noise fly over my head. I looked up and to the side of me there was a hummingbird floating in mid air. It flew over and landed on a telephone line in front of me. It set there about a minute looking at me and then it flew off in the exact same direction it came in. Funny thing is i have lived here for 4 years and I never see hummingbirds. Im just wondering if that had a meaning? My dad passed away 4 years ago and it’s been quite a grieving process for me. I have been trying to reach a higher consciousness and frequency so I can communicate with him. Over the summer, I went to a park to hammock and meditate. During my meditation, I had an out of body experience where I was floating above my physical body and was met by my dad (this is the first time something like this ever happened). We didn’t say anything to each other, just “sat” next to each other looking into the sun. I felt as if it was his hands on both my “out of body” shoulders and I began to deeply cry. During this state, I could hear a humming/flapping sound around the head of my physical body. Shortly after this deep feeling of grief and sobbing, I felt an instant wave of relief wash over me and a glowing white light. I started to descend back into my body and opened my eyes. As I laid there for a minute or two reflecting on what had just happened, I noticed a small bird land on a tree branch 10 feet in front of me. As I started to wonder what it was, it flew straight at me. It had been a hummingbird, and it flew right along my whole hammock. I noticed the sound of it’s wings was the same sound I heard during my OBE meditation. I knew then that it validated everything I had just experienced, but had yet to look up the spiritual meaning of hummingbirds until now. Although I already knew it was my dad coming to me through a hummingbird, it’s nice to have further validation of what I experienced. The universe is amazing. I was sitting on my front porch this morning waiting for someone to pick me up. The oddest thing happened. I have never seen a hummingbird around my trailer and it has been here since 2006. But, there was a hummingbird came around the corner and stopped right in front of me!! It hovered there for a few seconds and left the same way it came. It was amazing!! What do you think about this event? I’m working from home today and decided to sit in the garage. My wonderful husband, created a sitting area for me in the garage, with a tv, table/chairs and refrigerator. I often go to the garage to relax and enjoy the outside. This morning, I have been feeling a little down and uncertain about my employment situation. I was recently let go from my job at the end of 2017 and now I’m facing the end of a contract in November. A hummingbird appeared twice in the garage. The first time it appeared, I was scared, so I decided to research the meaning of hummingbirds and I learned their significance. I immediately felt bad for being fearful and it appeared again. I was able to really take it in and receive the beauty. I know the appearance of the hummingbird is telling me to accept change as a good thing, to let go of fear and worry and embrace what’s to come. Change is coming and I’m ready for whatever it is. Our beautiful Golden Retriever, Marley, of 14.5 great years passed away yesterday at home with my wife and I beside him. This absolutely tore me up to lose my friend that has always been there for me. I just let my other Golden and Marley’s companion, Jasmine, outside and hovering right in front of me was a hummingbird. I think this was Marley’s way of checking on us and letting us know that he is alright. My tears are still running. Last night I had an amazing experience. Yesterday I had very busy day which included going to my grief share group at the church. At the end of the day I was relaxing at a friends house and reflecting on my day. A beautiful little hummingbird started flying around and I said to myself, Matt if that’s you showing me that you are here with me I want to see Tessa too, I want to see 2 hummingbirds. And within a few seconds a second hummingbird comes flying by and the 2 of them are flying around chasing each other and sitting on the wire overhead. But it gets better, last week I ordered this necklace with 2 hummingbirds and had not received it yet… last night when I got home a box was sitting on my table and my necklace had just arrived. It must have been dropped of at the same time I saw the 2 visiting me earlier that evening. I was just standing on my back deck contemplating life as it is now. I have become ill with lupus and psoriatic arthritis and can no longer work my RN job. I’ve been trying to get a work from home nursing job so that I don’t have to try to raise my son on disability, have had to move back to the home we once shared with my ex because I cannot live on nothing, all of these things going through my mind as I was standing on the deck and, suddenly, two hummingbirds came face to face with me! There is no hummingbird feeder here, but they are! I immediately smiled when my heart was heavy, so even that one positive gesture made a difference. Today I was at work and went outside to get an item needed for work and saw an almost dead hummingbird on the ground. It must have flown into the glass door. I got a small towel and picked it up.its eyes we’re fluttering and rolling into the back of its head. I prayed for God to heal this little bird and reminded Him about the scripture how he even cares for the birds ( sparrows). I put it in the shade. The first time I went back to check on it it was standing, the second time i brought it some sugar water. The third time I checked I saw it fly away. It was so awesome! I got to hold,pet and pray for one of Gods beautiful creations. Thank you for letting me share. Blessed be. The day after my fur baby Luna passed away I was so upset and as I sat on the edge of my bed crying, I said out loud “if only I could know she was okay” literally 2 minutes after that a hummingbird flew up to my bedroom window and hovered right in front of it for a few minutes. Since that day, I have seen a hummingbird every day for the past few weeks. We have a hummingbird who comes around quite often. Today though he flew right up to my face. He scared me bc I wasn’t expecting it but then again that evening he did it again but to my husband. He’s never gotten that close to us before. I’m curious as to why he’s doing it now. Not that we mind, we love watching him. Today is my father’s wake , i was sitting on my front porch in prayer thinking about my father , when all of a sudden a tiny hummingbird flew to my hanging basket which. Is very close to where i was sitting . I was overwhelmed with joy , peace , light and love !!! What a gift ! My mother passed away 3 months ago and my stepdad just died last week of a broken heart Iam certain. We havent encountered too many hummingbirds up until now. This morning my daughter and I were sitting out on the front porch drinking our coffee and two hummingbirds flew right up to us while sitting. The one flew away and the other came back hovering in front of our faces so close that we instinctively felt the need to push ourselves back in the seat! My daughter had direct eye contact with it and I must say it was a very close encounter to what I believe a spirit of my mom or stepdad. Yesterday I walked out the door and one was hovering right in front of me as I walked to my car I almost opened the door on it! The other day one was hovering right above my daughters head outside while having a conversation with her dad. Also when my husband came home from work the other day one was flying over his car the whole way up the driveway and stayed with him as he got out of his car to talk with me. We both commented about how strange it was acting to be actually following him . What a joy and sweet feeling of delight and thoughts that perhaps our loved ones were letting us know they are back together and at peace. I recently lost a very close lifelong friend who was always there when I needed them. Today while sitting in a park a hummingbird flew in front of me and began to hover. Jokingly, I told a friend who was with me that I think that is the friend I lost and they were visiting in the form of a hummingbird. So I began to talk to the bird and tell it to fly more to the right, which it did. We laughed. Then I carried on and gave it more directions to fly more to the right and down a bit more. It was oddest thing, because it did moved in all the directions I had just given. We laughed some more how than must’ve indeed been my old friend. Today my Mom and I noticed a Hummingbird that was trapped in the barn and was covered in cobwebs and hay. We felt sorry for it but didn’t know how we could help it. An hour later I was standing in the middle of the barn when I felt a flutter against my arm and heard little chirping. I assumed it was the hummingbird and looked to the hayloft to see where it was. I still heard the chirping as of it were trying to get my attaintion and I tried to follow the sounds with my eyes. When I looked down and it was right at my feet looking up at me chirping; probably asking for help. I took the biggest piece of hay off the little bird and it flew a little ways but dropped back down. So, realizing how weak it was I picked it up and it stood still in my hand. I then went to find my mom and we spent the next few mintutes cleaning it up. It stayed really still and let us touch him and pick the cobwebs and hay off. We then went up to the owner of the property and asked if she has a hummingbird feeder. She didn’t but agreed to give the bird some sugar water and keep it over night. I really hope the little bird does ok. This week a hummingbird flew into my house couldn’t get out so I went close by to try help move him in the right direction out the window. I put my fingers out and to my shock it stopped flying and perched on my fingers. While I tried to move with it, it flew further into my house and went very high up in the ceilings. I tried again to tip toe and put my fingers out and it literally flew straight down onto my hand again. I never knew hummingbirds to do this, it was the most amazing feeling. I am still wondering what this symbolizes? I recently was visited by a hummingbird. I was in my house next to my screened in bedroomroom window, the hummingbird flew straight towards me and hovered right outside the windows screen. It was right in front of my face, when I stood up it went up with me and looked at me through the glass of the window. When I sat back down it came back down and looked at me through the screen again. I wonder… if I’ve been visited by a spirit . My pet (son)Riley brother to my sweet girl, Skye, a Cairn Terrier. He was tragically killed two years ago. I built a small rock Cairn, as a Memorial for him. This Cairn consists of just three rocks, representing his body and another rock as his pedestal. The pedestal rock resembles a bicycle seat. Our favorite pastime was, the dogs running while I mtn bike. The three rocks representing Riley, were rocks I literally tripped over on my walks immediately following his death. I saw a lot spirit animals at that time, I could write a book about. Anyway. I just recently moved and relocated his Memorial Cairn to a new place in my yard. Could this beatiful hummingbird represent Riley’s spirit thanking me? I was sitting in a lounge chair with a good book and my yorkie at my feet one summer day on my patio. As I was reading, I heard a buzzing sound with a touch of flutter. I slowly turned my head to my right towards the sound . I was practically nose to nose with a cute little hummingbird! It was the most precious visit ! It lingered long enough to get a good look at my face and then flew away. This experience was so very memorable! I am 26 years old. and i lost my mother almost 3 years ago to cancer. Every time i am outside playing with my son (who my mother never got a chance to meet), there is always multiple humming birds that fly near my son and I. Almost landing on us, they come so close. What could this mean? and if it is a message from my mother. How can I know what she is trying to tell me? There’s no doubt in my mind that my mother speaks to me through a hummingbird. She passed away February this year and I’ve been lost without her. My mom was my best friend. I was having a real hard time getting through it trying to stay strong for my father. It started at the mortuary when we were making plans for her funeral services. My dad had decided that mom was to be cremated. It wasn’t that I disagreed I just got very emotional just thinking about it . I tried not to let anybody see me crying so I got up and looked out the window that had a beautiful view of water fountain, on a little man-made pond with swans a few ducks. I saw a rainbow that was cast over the water fountain. t made me smile and I wondered if she would have liked this place? It wasn’t but seconds later that a small tiny hummingbird flew up to the window and looked right at me. It was almost hypnotic because I just stared at it and it stared at me it seemed like hours I’m sure it was only for a minute but in that minute I was lost for I know my mom there. Others will tell you it’s coincidence. I will not, I believe it’s my mom sending me the message that she’s there and watching over me because it’s happened to me several times. I have never seen a Hummingbird at the house that I left in. Recently I hung a Keepsake of Mom’s up in a garden window of my home. It was on the right side of the window. After hanging it in the window I saw a hummingbird it was fluttering there in mid air staring … not on the left side ..not in the middle … but right where I hung the Keepsake for Momwith her picture. She is and always will be wit me and she’s sending her live thru the hummingbirds. Next time you and your son see one, tell her you love her and miss her, she is watching over you. I have feeders in my front yard and out on my back deck. On occasion they will come to the window and hover looking at me. Wonder if that is how they thank me for providing fresh sugar water every other day. Saying hello and bringing light and joy! We lost a family member and it is a really tough day for all of us. While sitting on my patio today, talking to my sister about him I got a visit from 2 hummingbirds who flew around me..then one of them flew right up to my face and hovered about 6 inches from my face looking into my eyes for about 30 sec. I said hello and felt at peace and thanked him for coming …it then flew around my head and flew back to the flowers. After I told others in the family about the hummingbird experience I had they also started telling me that they were visited by hummingbirds in similar ways at about the same time I was visited. I am commenting today because I just had the strangest experience of my entire life in an encounter with an animal. I was driving with the windows down at about 35 miles per hour when all of a sudden I look down and there is a hummingbird sitting in my lap on it’s back facing me looking at me right in the eyes. I immediately stop the car in the middle of traffic and take him to the nearest area of grass and bushes and place him on the grass and turn him over on his feet. He seemed to be perfectly fine so with the 10 honking cars at me because I just stopped traffic I ran back to my car not even fully realizing what just happened. Once in a life experience. So this year has been one of the most difficult and successful time for me. I have been so unsuccessful finding joy and hope or just haveing the same spiritual faith that I typically rely on. One negative big thing after another not included all the small uncontrollable factors of life that always contribute. A new baby and passing of a best friend all alone I have been drained with no lite no support about to start over and as I time out to evaluate my next move a hummingbird comes and hovers right in front of me for seems to be a while . The himmimg bird leaves I have been nothing but overwhelmed and full of anxiety the last couple months since last lifr changing nevent, so I think nothing of it. I am crying and here the same bird comes again and was only about an hour later. It gave me a smile. Well I have been on this trip for 5 days and every day this same humming bird has visited me and he hangs out right in fround of my face just almost talking to me he starts to have and I talk to him back he stops almost as I need to follow or is pointing for me to follow the guide. Today is the first day I have not had my day taken over by panic and hopelessness . So many visits amd more than once every day and longer each time. I have been saying lately I shall win the lottery soon or something great because if it can go wrong it goes worse for so long that I have lost myself and happiness in the process I have been so stuck and I seem to finally have a glimpse of some lite or the idea of light . How far so I follow the beautiful serene hummingbird. I was sitting outside yesterday and heard a loud low hum in my ear. I thought it was a bumble bee at first so I moved my head a bit. When I moved my head the hummingbird flew right between my eyes and stayed there for awhile looking at me, even moved it’s head like it was trying to communicate something, then flew away. This morning, I was pulling out of my garage on my way to drop my daughter and her friend off at the airport for their trip to Israel and TWO hummingbirds came from the sky and hovered in front of the windshield, facing us. One on my side and one on the passenger side where my daughter was sitting. I’m still trying to figure out what these visits mean! It was definitely magical. That’s for sure! I had a dream that i was at my gma’s house. I was downstairs and was holding a hummingbird in my hand. It fanned its tail out. Skip forward the 4th of July evening. I went to a friend’s house who has a deck with a pop up to shade. My partner found a hummingbird fluttering in it. I caught it with my hand. It chirped a bit then i let their daughter pet its head then i put it on a buddha head outside of it and it fanned its tail and flew away. On Thursday I received the news that my cousin had passed away. Since that night it hasn’t been easy. He was the eldest out of all of us cousins. The last time I saw him was this past November and all I do is think about everything we said to each other. And the giant hug he gave me when he first saw me. Every time I see his picture I can’t help but cry. A couple nights ago, I was asking him to give me some type of sign, just so I knew everything was going to be okay. Half an hour ago I was driving back home from work and I was thinking about him when suddenly two hummingbirds came up towards the car and the feeling that came over me was indescribable. I had to look up what it meant and I came across this page. As soon as I read the part where it says that my loved ones in heaven might be sending a message to tell me they are well, gave me chills. In that moment I knew it was my grandparents telling me he is now with them. I was getting my son on the bus last week and we were about 5-7feet apart and right in between us a hummingbird hovered and stayed there for a few seconds. It was beautiful. It didn’t just happen. It happened for a reason from our loved ones spirit. I’m newly awakened as of 10/31/17 and still learning and loving my new life. It has its ups and downs for sure. Like last week how I wanted to give up and kept asking my dad uncle and aunt “why? Why did you chose me? WHY!! ?” But this week things have been looking up and I’m plugging forward. It’s hard when you become awakened especially when you don’t have anyone but the internet. After a 9 year relationship it is coming to an end .His mother of course puts all the blame on me solely funny he was the one hiding a secret life not me . His family is staying with us for a week .So i walked out side to get away from the negative impact from her. 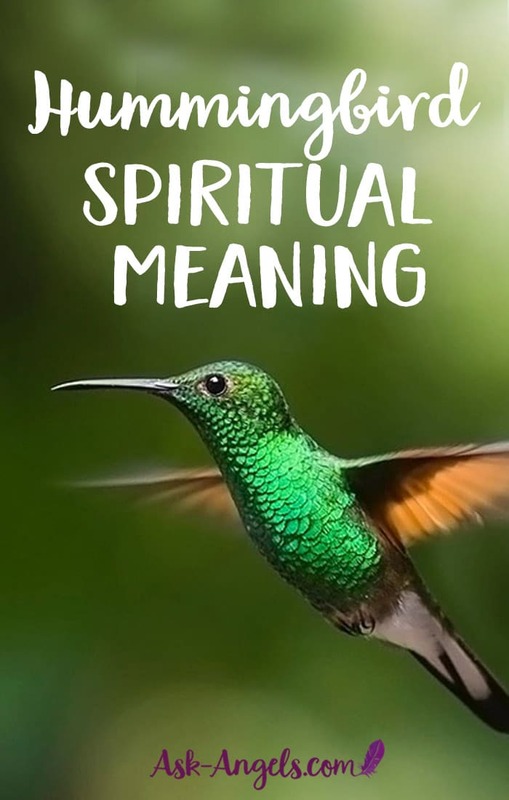 I ask God for a sign shortly after a hummingbird come right up to me .I felt complete joy to see the hummingbird and felt compelled to look up the meaning of such a BEAUTIFUL bird and found this site .Thanks for the inspiration. A hummingbird literally was just in my face. I didn’t know what it was so I ducked because it came so close. And as if to say, “it’s ok” she backed up and stayed for a few seconds so I could see that she was a hummingbird. I immediately knew that it was God sending a confirmation of how I was feeling today and last night. I’ve asked about love. I know it’s coming. But now it is confirmed that I need to enjoy the moments and savor the sweetness of life as is. This morning in Phoenix on my way to work driving through our neighborhood a hummingbird came and hovered above the street we were driving through & it seemed to wait there until we drove by. My 21 year old daughter Angelita & I were delighted to see him & I were surprised they’re still around given the recent heat warnings. Every time I see a hummingbird, I recognize them as light healers and say a wish or prayer- thank you God for sending them to remind us of your presence. So literally like 2min ago I was sitting outside, and had just finished watching a YouTube video of the rapture is here, June 3 2018. I have been experimenting and learning about higher self and energy a lot lately and then as I’m sitting here this humming bird comes up to me it kinda freaked me out for a second. Then I realized what it was, he flew by and then went in circles came really close to me like he wanted to come inside. Then flew away, so it’s 730 am and daylight right, all the outdoor lights have been off for a while as far as the ones that only come on at night. Instantly after the bird flies away (and not going to lie, I’m looking for him to come back ) the light right across from me that wasn’t even on just flickered, or blew or something. …. what does that mean lol? So sorry to hear about your loss, but glad you got such a beautiful sign from the hummingbirds. I’m sure they’ll be back to check in on you and bring you blessings of love and joy. I have been going through a tough family situation and my husband and I got into it on the phone, he yelled and hung up in my face. I was not going to answer any of his calls. After 15 missed calls, I came outside to cool off and think. A hummingbird flew 3 feet away from my face for about 20 seconds before flying away. I took it as a sign and answered the phone. My husband apologized and re assured me that he loved me. I thank my spirit guide for all the signs he gives me on a regular basis. Love conquers all! Love really is so powerful! Know that you can ask the angels to clear the lines of communication between you and your husband. See and visualize golden violet light cutting through any negativity or miscommunication. I was sitting on the porch ealy afternoon and have been feeling depressed and lonely lately. All of a sudden i hear a light almost buzzing sound i thought maybe a vee was by me. I turn my head and looked up at my porch and there was a humming bird trying to drink from a feeder the lady that lived here before me left. I ve never seen a hummingbird up close ever like that it was beautiful. My grandfather recently passed away in March. When I was younger, we used to garden together and he would always point out the food he made so that hummingbirds would come visit him; he said they were his favorite. The three month anniversary of his death just passed a couple days ago and when I pulled up to my house today, there was a hummingbird buzzing around my front lawn. I just know it was him visiting me! What a beautiful reminder of him you have in the hummingbirds! I am a very spiritual person….my daughter has Bees in her life always. I know what they symnolize..I was curious what the hummingbird symbolized. I love these birds…I grew up on Himmingbird Drive!! Hahaha never a coincidence. I found a baby hummingbird a couple of days ago on the grassy area of my community. He was so tiny. I was afraid to pick him up, but I thought of all the feral cats we have skulking around. I went to find one neighbor, and a long the way I encounter another. She took off one her shirts and picked the baby hummer up. I hadn’t seen her in months. I don’t know what is going on, but she has lost a lot of weight. I think we were meant to find it together. I got the little guy to a rescue place forty minutes away. He was feisty didn’t want to let go of her shirt. He was meant to teach us something. My sweet daughter hung herself on 9/15/17. My sister bought thickets to a medium that was coming to Vegas . The morning of the show, i was on my back porch having my coffee, and a bright green hummingbird flew under my patio table. He was literally 6″ from the ground. He hovered for a while, then flew under the chairs. I really thought he was trapped, when suddenly he flew away. That night at the show with the psychic, i got a small book on how our loved ones contact us. Two hummingbirds on the cover. Open the book…..paragraph on hummingbirds. Said if u see a hummingbird acting strange, you can be sure it is your loved one. Hi there, I love this explanation of significant meanings. Right now as I type my mom 61, me 29, & my daughter 5 live in a home and in our backyard have a female hummingbird who has layed an egg or two at the most. I read up on hummingbirds, in a small little nest made all on her own in our tree we have!!! My mother noticed it about a week ago and since then me and my daughter checked on her daily.We let her be and do not want to scare her because, we do not want her to abandoned her nest. She leaves for short while and remains protective on her baby!! It did not seem to phase me much until day 3 or so and more I started to think how amazing this was to experience. !! Then after reading the info on nesting, how long they live, how HB do not nest in the same area again usually. This is a big deal and I’m so glad she ( the mamma hunnmingbird or baby Leah) as my daughter says 💕🤗😁 choose us, our tree!!!! Our 13 year old French bulldog, Guinness died in January after a battle with lymphoma. Before we put him to sleep, I told him to visit my husband and me anytime he wants. That weekend, I was watering a hibiscus. An anna’s Hummingbird flew up to me, and also flew in between my legs. I knew it was Guinness visiting me. He comes by everyday. I also have two others who have been coming by. I really believe are my beloved cats, Fluffy and Cinnamon. They hover and dance in the air. It makes me smile and it is a real joy to have these creatures in my yard! May your hours and days be numerous. May your eyes always witness God’s great love for you. Or however you put that. Hi Debbie, the same thing happened to me the day my mother died. She died early morning and after spending most of the day making all the arrangements, I got home and sat on the deck with my landlord for it was a beautiful warm sunny day for late May. Here in New England, May 20th is too early for hummingbirds. As I was sitting there, all of a sudden there she was! A beautiful little hummingbird suspended right in my face for several seconds. No flowers even in bloom, no flowers anywhere, no red anywhere. I knew it was my mom letting me know that she was fine, happy, and that I would be ok for she would never leave me. Thank you for your story. I hugged my phone for you. Great post! Hummingbirds often visit us at our cabin. One year we were sitting on the porch and a hummingbird came so one of my sons stood up, put his hand out….the tiny bird landed on his finger and sat still for close to 20 seconds. We were able to get a picture. Amazing! For over nine years now hummingbirds have been coming to my home, they arrive in spring and are here until late fall. If I do not have their sugar water out in early spring. they come to my back door screen and let me know they are here. I love hummingbirds and look forward to seeing them every year. When I see hummingbird it symbolizes joy for me.A person who is so optimistic that can turn every situation into something interesting. A few years back, my mother in law was living out her final days, on hospice, after battling Alzheimer’s for some time. My daughter, age 12 at the time, was very close to her grandmother and was extremely saddened that her time to pass was approaching. My husband was with his mother during her final moments. I was home, waiting on the news of her passing. My daughter was outside playing when my husband sent me a text to tell me she crossed over. Within seconds, my daughter came running inside our house, excitedly telling me that a humming bird just came and paused by her. It was litterally, the exact moments of my mother in laws passing. 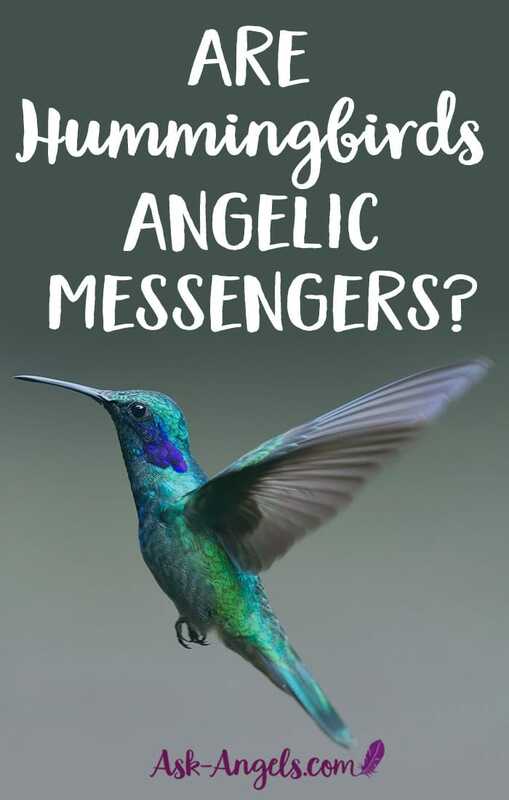 I knew immediately that mom ‘s spirit cane to my daughter through that hummingbird and I knew she was ok.
How beautiful Kim… This is such a great example our loved ones in Spirit leveraging hummingbirds to let us know their souls live on!